Charting Classic N.Y. | Hawking Hamburgers at J.G. Melon | A Continuous Lean. A pungent scent has begun to blanket New York, and no I’m not referring to that funky smell coming from the Lower East Side, I’m talking about the alluring aroma of sizzling burgers that’s rising up from griddles all across the city. Between the now numerous Shack Shake stands (respected, but generally overwhelmed with tourists), the East Coast debut of Umami Burger [delicious to the power of the magical fifth sense, but easier to just enjoy in LA), and the “bespoke” burger which can be found at high end (and high ticket) eateries New York has been swept up in full blown burger mania. The great burger debate has now become a relentless pastime for gourmands throughout the five boroughs with no consensus in sight. While you might be harboring your own unwavering patty preference, the common ground on ground beef lies in history, and no burger joint is more fit for the history books (or at least in the Preppy Handbook) than J.G. Melon. Climb high enough up Third Avenue and you’ll find yourself staring down a crimson colored neon sign that proudly proclaims â€œJ.G. Melon.” Step through that faded forest green door and you’ll find a cramped interior that’s no match for the scores of burger buffs that Melon’s garners on any given night. Beneath the chock-a-block decor, which features watermelon motifs of every size and variety, European tourists, yuppified locals, and celebrities wait for tables and scarf down juicy, old-school style hamburgers. Since opening their doors for business in 1972, Melon’s has never given anyone special treatment, and it’s no wonder why wait times can be as long as a couple hours. 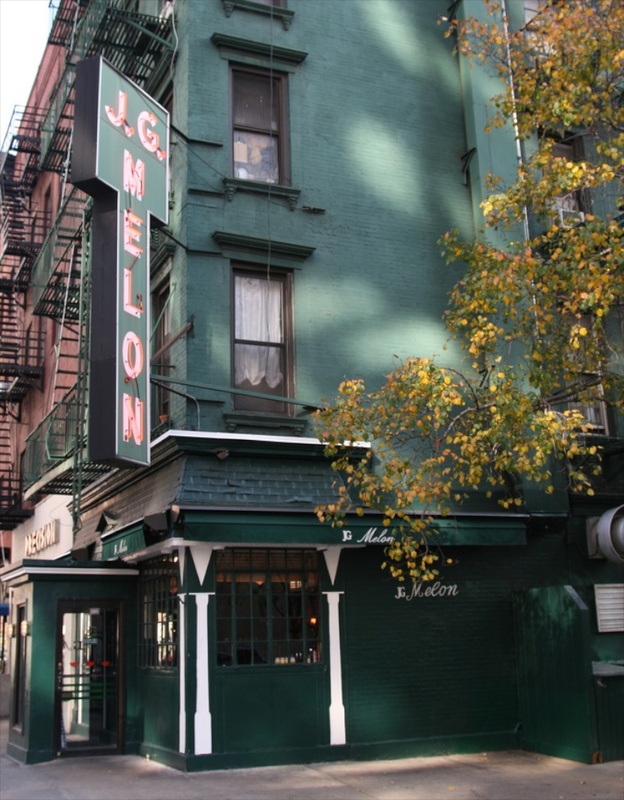 Ralph Lauren once declared Melon’s to be a favorite of his (it certainly doesn’t hurt that the restaurant looks like the perfect setting for a Polo photo shoot, complete with rakish retirees), Kramer vs. Kramer was filmed in the space, and Melon’s burgers constantly make “best of” lists. 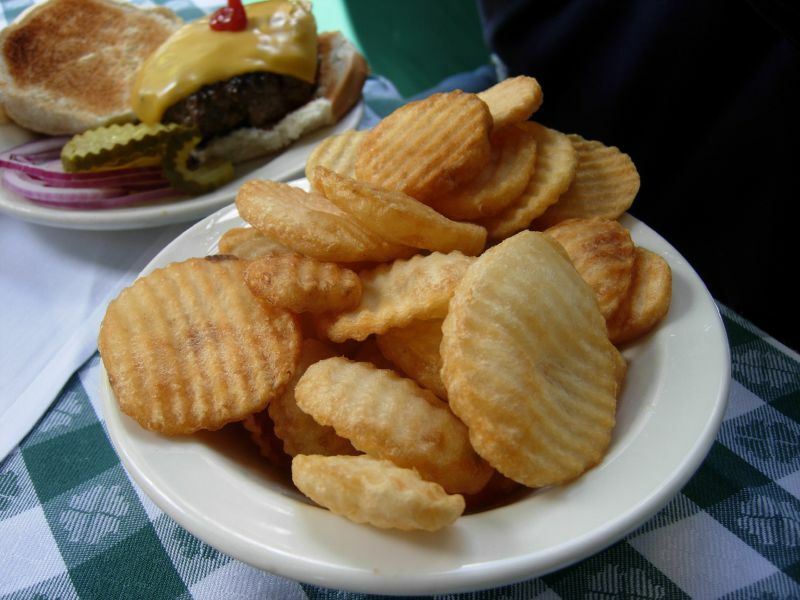 You won’t find any truffle toppings or brand name beef here, just a greasy bun, a crunchy burger, and some crisp cottage fries. It’s a simple formula that’s packed Melon for four decades, and with any luck it’ll keep them crammed for decades to come. After all, good things come to those who wait. Love that you highlighted JG Melon’s. I grew up a few blocks away and ate there frequently, so I offer 1 correction based on my observations. While I have seen many celebrities waiting on line with no special treatment – there was 1 person who also appeared to get special treatment: Abe Vigoda. I’m not sure how often he ate there but it must have been frequent because I saw him (literally) every time I ate there and often some him through the window in one of a couple window tables. We’ll go when we are in New York again! They should put this recommendation on their wall. Ah Melon’s. As a Vegan.. I can confidently say that this has and will now forever be one of the best burgers I’ve ever had.